Let’s face it - finding the perfect Valentine's gift can be really complicated. What do you get for the person who has everything? How can you communicate your message to your sweetheart without giving the same cliche gift? As with many questions in life, cookies are the answer. Have cookie gift boxes delivered to your friends and family anywhere. Choose from our scrumptious cookie flavors (including gluten-free and dairy-free varieties), and customize a keepsake cookie pail. Ali’s Cookies has Valentine's cookie delivery down to a science because we’re the cookie-shipping pros all year long. We don’t just bake the most amazing Valentine's cookies - we ship them practically anywhere in the continental USA. Because cookie delivery is our bread and butter, you’ll never have to get into a “tiff” with customer service over whether your loved one’s home or office is in a delivery zone. This year, skip standing in lines, save time wrapping your present, and give a gift that will stand out. Order Valentine's cookie boxes for your loved ones! 9" Personal size heart shaped chocolate chip cookie cake. Tell us your message and we will spell it out using our delicious hand molded chocolates. Limited area for the message so keep it short and sweet. Let us know what colors etc. What a great way to say "I Love You" 14" delicious heart shaped chocolate chip cookie cake. Tell us your message and we will spell it out using our delicious hand molded chocolates. Custom design this cake by letting us know what colors, etc. We can even add an edible photo image; make sure to select PHOTO OPTIONS when ordering. 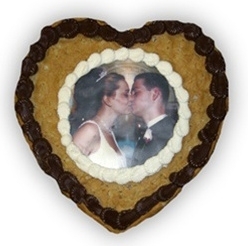 What a great way to say "I Love You" 14" delicious heart shaped chocolate chip cookie cake with your completely edible photo. What a great way to say "I Love You" in a very personal way. 12 piece assortment of delectable cookies. Packed in a "Heartstring" pail. Each cookie is individually packaged in a cellophane bag and labeled. This is a gift that is sure to please. 12 piece assortment of delectable cookies. 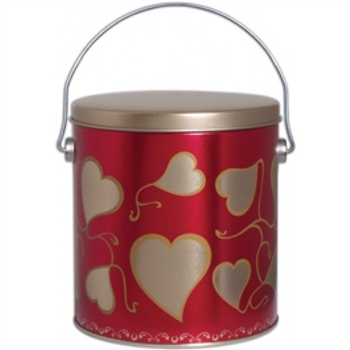 Packed in a "Sweet Heart" pail. Each cookie is individually packaged in a cellophane bag and labeled. This is a gift that is sure to please. 18 piece assortment of delectable cookies. 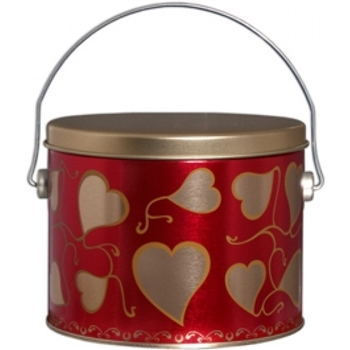 Packed in a "Sweet Heart" pail. Each cookie is individually packaged in a cellophane bag and labeled. This is a gift that is sure to please. 18 piece assortment of delectable cookies. 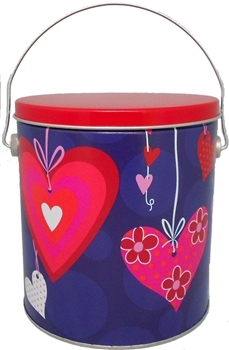 Packed in a "Heartstrings" pail. Each cookie is individually packaged in a cellophane bag and labeled. This is a gift that is sure to please.